First, many novice engine builders believe if their crankshaft is gouged that all it needs is to be polished. In most cases this line of thinking is wrong. Gouges, caused by material that may have been embedded in engine bearings, can damage a journal. Polishing can’t take these defects out of journals; at least with any degree of accuracy. If there are a lot of deep gouges, lines or other marks in a journal, chances are grinding the crankshaft first is the best course of action. Generally speaking, crankshaft polishing is the last step in the crankshaft repair process. Normally the crankshaft has been ground first, and the polishing process is used to take off the microscopic peaks that the grinding wheel leaves behind on the finished journals. Many automotive machinists also choose to chamfer the oil holes just before polishing the crankshaft, which aids in removing burrs and helps the engine oil leave the oil passages when the engine is running. Regardless, polishing removes the peaks on journals and seal surface areas so that a smooth microfinish is created. This helps to reduce bearing and seal wear so that rebuilt engines will last for many miles under normal operating conditions. Although there are dedicated machines to polish crankshafts, like the one pictured to the left, most crankshaft polishing operations occur right in the grinding machine after the last journal has been ground. The reason for this is simple; with the crankshaft already in the grinding machine, there is no setup time required to use a different piece of equipment. To polish the crankshaft in a grinding machine, the automotive machinist will simply need a portable polisher that has been designed specifically for use on crankshafts. 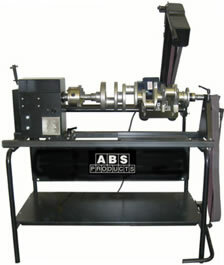 A portable crankshaft polisher, like the one pictured to the right, operates on a standard 120 volt outlet. When not in use, the polisher can be easily unplugged and stored in a safe location that is out of the operators work area. This polisher uses a special type of belt that is designed to come in direct contact with the crankshaft journals and seal surface areas as the crankshaft is slowly rotating within the grinding machine. Crankshaft polishing belts, like the one pictured to the left, are available in a variety of lengths, widths and grits. Depending on the type of portable polisher used, which is adjustable, the length of the polishing belt can vary from 60” to 72” in length. The width of the belt being used to polish crankshafts is determined by the crankshaft journal or seal surface width. For V8 crankshafts, a one inch belt is normally used while V6 crankshafts normally require the use of a ¾” belt that fits between the narrow counterweights. 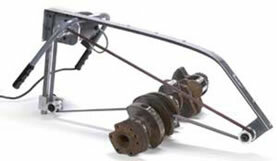 To polish crankshaft journals, a 400 grit belt is almost always used. When a new belt is put into production, it is often first used on a piece of steel to take the sharp edges off of the belt before it is used on any journals or seal surfaces. The concept of polishing is to finish a crankshaft with a microfinish that is appropriate for engine bearings and seals. Using a coarse belt will not only leave an undesirable finish, but may also take off too much material and throw the journals out of tolerance. By using the appropriate belt and operation, polishing should remove no more than .0002” of material. It is important to note that some less experienced engine builders attempt to cleanup their crankshaft’s journals with a 200 grit belt. Although these belts can take out minor gouges and lines in journals, the end result almost always consists of journals that dip in the center. This dip, and out of tolerance condition, exists because polishing belts are not ridged on their ends. The absolute center of a polishing belt has the highest capacity to remove material. Polishing should never be used to repair visual defects on crankshafts. Crankshaft grinding is the only process that can correct visually damaged journals. Most quality crankshaft polishing belts are designed with an aluminum oxide abrasive that is bonded with either glue or resin. Although the most common types of belts have straight edges, others have scalloped edging that is designed to polish into the radii. Though paper based belts are widely used for most crankshaft polishing operations, abrasive cork belts are also available for super fine finishes. Regardless of what type of belts an automotive machine shop uses, the belts lose their effectiveness over time as the bonding agent deteriorates and as the belts become loaded with material. Since there is no way to dress a belt, proper belt maintenance includes blowing of the belt with compressed air. This process helps to dislodge some of the material that is embedded between the abrasives. Should the embedded material on the belt become too great, it should be discarded and a new one placed into production. 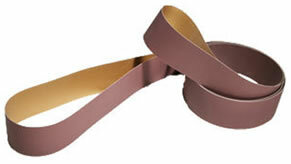 Polishing belts are normally sold in quantities of ten per box. Depending on which type of belt is purchased, the average cost can range from $2.50 to $4.00 per belt. Ordinarily, a polishing belt that has been maintained properly can be used to polish fifty crankshafts or more. Now that you have learned more about the crankshaft polishing process and important considerations that automotive machinists must consider, please rate your opinion of this page below.